A curious mind needs to be fed at regular intervals. It may either need information on a new topic or a fresh perspective on a known one; it needs a challenge, but doesn’t want to be overwhelmed. Viruses: A Very Short Introduction does just this. Much like a well-flavored appetizer, it will feed the curious mind with tasty morsels that won’t overwhelm the senses. Instead of spice, however, it’s filled with basic virus biology, genetics, and immunology. Dr. Dorothy Crawford is a well-known writer of infectious disease books such as The Invisible Enemy and Deadly Companions, and like these books, this one is well written. 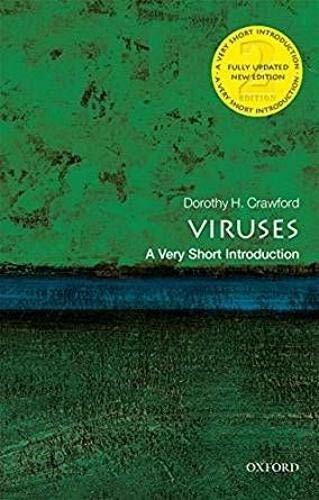 It is also a great introduction to the topic of viruses; she adds small layers of information and carefully augments the layers with repetition. She also refers back many times to previously learnt material. Clearly, it is designed to teach with a vivid narrative that flows, sometimes with suspense, always illuminating knowledge of the virosphere. The intended audience is the non-scientist, but it will also entertain someone with a large background—it is loaded with meaningful comparisons and historical references that deliver perspective. A glossary is provided for readers in need, and references for further reading are given. The book hits its intended mark by relating the biology of viruses to their ability to cause change in our bodies and our environment, and to their ability to persist. The first chapter, What are viruses?, highlights the viral structure and basic mechanisms. Herein lies the most terminology, but along with the glossary and otherwise accessible language, it will provide you the background necessary to understand and enjoy the remaining chapters. The remaining eight short chapters are fascinating: Viruses are everywhere; Kill or be killed; Emerging virus infections; Epidemics and pandemics; Persistent viruses; Tumor viruses; Turning the tables; and Viruses past, present, and future. Within these chapters you will learn how the immune system protects us, how vaccines work [or don’t], and how people become infected. In addition, you will also learn how epidemics start and why some infections persist. One example of a historical perspective Dr. Crawford provides is why the incidence of hepatitis C virus is so high [approaching 20%] in Egypt: “. . . where a treatment program for the parasitic disease bilharzia in the 1960s unwittingly spread the virus by using non-sterile needles.” These types of thoughts are scattered, logically, throughout the book, and help digest the information. The book contains many facts that will make you wonder at the world around and within us. Did you know that viruses are the most abundant life form in the ocean, and that they have a significant role there for maintaining life on earth? Among other things, marine viruses control the population of phytoplankton [food for fish and other marine life]. Did you know that viruses also persist in abundance within us; some apparently causing no harm, but others may cause cancer or other illnesses? Did you know that deforestation and changes within our environment may currently be leading to emerging viral infections like Nipah virus? Compared to conventional virology introductory texts, this pocket-sized version is more accessible. It’s neither dry nor too in-depth. Anyone with a curious mind who wants to boost his or her scientific literacy will enjoy Viruses: A Very Short Introduction. In bite-sized fashion, baseline knowledge gets built and feeds the curious mind, just a taste; it is strangely sweet.